Coming roughly 10 days earlier every year, Ramadan has been hitting Cairo right in the scorching summer heat for a few years now. Muslims fast during the sizzling daytime and spend the evenings among family and friends – with desserts featuring most prominently in every nightly gathering. While patisseries this Ramadan are presenting innovative desserts -- such as Qatayef with Nutella, Red Velvet Basbousa and Pumpkin Konafa -- the uncontested favourite for many remains that combining the best of Ramadan and of the summer fruit season: Mango Konafa. Egypt is famous for its variety of mangoes, which are rich in flavour and smooth in texture. Mango was introduced during Egypt's agricultural renaissance by Mohamed Ali Pasha in 1825. Since then, Egyptians have continued to venerate this exotic fruit which had found a new home, and Ramadan simply gave food innovators a chance to play around with it. Being a passionate foodie, and so ridiculously enthusiastic about mango that my father and I purchase cases of it directly from orchards every year, the mix of konafa, cream and mango is just simply irresistible. This is how a friend and I ended up hosting “Konafa Bel Manga Extravaganza”, where we invited friends to break their fast with a super light iftar on the second night of Ramadan and bring Mango Konafa platters from as many different patisseries as possible, so we could sample them together. Le Carnaval invented Mango Konafa more than five years ago when Ramadan in September coincided with the height of the mango season in Egypt. Their konafa consists of two layers of cream, mango and konafa and an additional layer of juicy cake. These are topped with a layer of konafa and what can only be described as a pyramid of mango pieces. The entire platter is held together by a konafa fence. While the group agreed it deserves the winning title, the price of the platter – a hefty 350 LE – is a substantial drawback, especially since other versions came close on the scale of deliciousness. Le Carnaval also makes mini-mango konafas, which are relatively cheaper. One of Cairo's oldest upscale bakeries, Simonds put their Mango Konafas in bowls – large and individual-sized. Both came to the party. The small bowl is significantly lower in quality than the larger bowl. The dessert includes several layers of konafa, cream and mango – with the small bowl only housing a layer of each, losing the richness. Having said that, Simonds succeeded on the fresh, tasty mango front -- which really either makes or breaks this entire affair. Now here is the black horse of the race. While its presentation is weak compared to the rest, we tried their individual-sized Mango Konafas and they were delicious. The konafa was quite soft, not soaked in syrup, and therefore offered a solid base for the cream and mango to really take the lead in the dessert. Like Simonds, their choice to add tasty mangoes did them wonders. Tseppas garnered a well-deserved second place in the Konafa Bel Manga Extravaganza vote, although this writer was happy to give place it first among the evening’s samples. 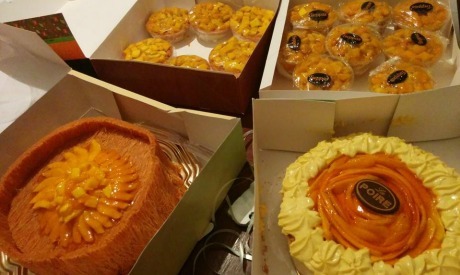 While La Poire boast the largest number of franchises out of all the bakeries which make Mango Konafa -- and thus are the most famous -- and despite their history of using fresh and flavourful ingredients, their Mango Konafa was disappointing. The mangoes were quite sour, the cream looked and tasted more like condensed milk, and their presentation lacked grace. Not to mention that the konafa failed to keep its composure once the slicing of portions began. While Sale Sucre was not an official contender in the Konafa Bel Manga Extravaganza, it is an opponent more than worthy of mentioning. Sale Sucre managed to score high with the writer, and her family, in terms of sweetness of the mango, fluffiness of the cream and crisp of the konafa. It is also quite light on the stomach compared to its counterparts – which means you can eat more of it without feeling as though an elephant was lounging across your chest as you drink your post-iftar tea and watch TV series. On a final note, Ramadan began this year with the very start of the mango season. Therefore, it is unrealistic to expect the mango to be as tasty as in previous years. Furthermore, let’s bear in mind that 2014 may be one of the last times we enjoy this delicacy in another 20-25 years, when Ramadan will once again coincide with the mango season, so let's make the most of it! Thankfully, we will still have Nutella, pumpkin, red velvet and blueberry konafa to get us through these tough times.